Holy Spirit In Action is a growing church where great deliverance is taking place. A teaching ministry that trains saints to become warriors, learning how to operate in the ministry. A Bible teaching and bible believing ministry, where the Holy Spirit is in full control. We understand that man is three parts, spiritual, physical and a supernatural being. We believe in the Five fold ministry-Apostle, Prophet, Evangelist, Pastor and Teacher. The Holy Spirit is our comforter, the bible states," But when the Comforter is come, whom I will send unto you from the Father, even the Spirit of truth, which proceedeth from the Father, He shall testify of me." John 15:26. And When the day of Pentecost was fully come, they were all with one accord in one place. The only way the spirit can take action we must be on one accord... And suddenly there came a sound from heaven as of a rushing mighty wind, and it filled all the house where they were sitting. We are Holy Spirit in Action, we don't sit but move, and in our moving we have have seen the nine gifts of the spirit in action. The Gifts of the spirit..Word of Wisdom, Word of Knowledge, Faith, Healing, Working of Miracles, Prophecy, Discerning of Spirits, Divers kinds of tongues, Interpretation of tongues. God has given our leader Apostle Belinda Davis a rich and anointed word that deals with the whole man. Her motto is "If God said it, nothing else to be said." The excitement of what God is doing has blown the mind of the saints, the time is at hand to receive and see the mighty move of God. And because we believe God He is manifesting Himself through healing, miracles, deliverance, signs and wonders. 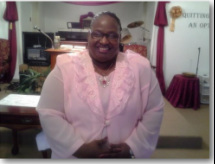 COME VISIT AND SEE THE MIGHTY MOVE OF GOD..
Apostle Belinda Davis was born May 5 in Macon, GA in Bibb County in the Middle Georgia Hospital, the first of seven siblings born to the parentaqge of the late Mr. Allen and Mrs. Christine Maxwell. She received her education in Bibb County, Macon GA. In 1973 after graduating from Central High she enlisted in the United States Air Force, with the command trade of Air Craft Maintenance Specialist. In 1978 Apostle heard the voice of God and dedicated her life to Christ, the same year while living in Charleston South Carolina while still in active duty, she met and married Sargent Joshua Davis. They became the parents of two wonderful children, Anitra Jevon Davis and Isaiah Jeremiah Davis. In 1980 the family relocated to Myrtle Beach South Carolina, there she united with Mason Temple Church of God in Christ under the tut-ledge of Elder James Lee. She accepted her call into the ministry and received her missionary licensed and was chosen for leadership of the YPWW. God had a plan she met Pastor Helen Flower who had a dynamic teaching ministry where she learned the dynamics of the word of God. Being led by the Holy Spirit she united the family with Cainhoy Miracle Revival Center INC. under the leadership of Apostle Helen Smith. Under the tutledge of Apostle Smith, Apostle Davis was licensed and ordained an Evangelist. Obeying the voice of God Apostle Smith knew it was time for Evangelist Davis to walk in the full calling God placed on her. She was sent to Macon to assist in ministry with her beloved mother. They came under the umbrella and started Macon Miracle Revival Center, God soon began adding to the church. She led the church into the community spreading the good news of Jesus, as a result many souls were won and led to Christ. 2000 Apostle Davis was installed as the newly appointed Pastor. Under her leadership God led her to train the saints to be effected in the ministry, warriors for the Kingdom of God. She knew the only way that they could be effected was through extensiveness of training, preaching, teaching. In 2009 being led of God in a dream, God spoke to her to start her own ministry. In much prayer and fasting directed by God she came from under the umbrella of Miracle Revival INC. In 2010 she established 'Holy Spirit In Action INC" God began to deal with Apostle Davis and through His instructions in 2011 she was ordained, licensed and installed as an Apostle. Under her tutledge God began to raise men and women in the ministry, some called to pastor, prophets, evangelist and teachers. Colossians 3:5-10 Put to death, therefore, whatever belongs to your earthly nature: sexual immorality, impurity, lust, evil desires and greed, which is idolatry-- Becaus of these, the wrath of God is coming-- You used to walk in these ways, in the life you once lived.-- But now you must also rid yourselves of all such things as these; anger, rage, malice, slander, and filthy language from your lips.-- Do not lie to each other, since you have taken off your old self with its-- and have put on the new self, which is being renewed in knowledge in the image of it's Creator.